Prototype: German Federal Railroad (DB) commuter car, 1st/2nd class (type ABnrzb 772.1). “Silberling” / “Silver Coins” design with a rounded roof painted and lettered for “City-Bahn”, with a cafeteria area. Model: The car has the new longer length. The minimum radius for operation is 360 mm / 14-3/16. The car has underbody details specific to this design. The trucks have disk brakes. The car is ready for installation of the 7319 current-conducting coupling or the 72020/72021 current-conducting couplers, 73406 pickup shoes, the 73400/73401 (2 per car) lighting kit, and the 73409 marker light kit. Length over the buffers 28.2 cm / 11-1/8. DC wheel set: 4 x 700580. 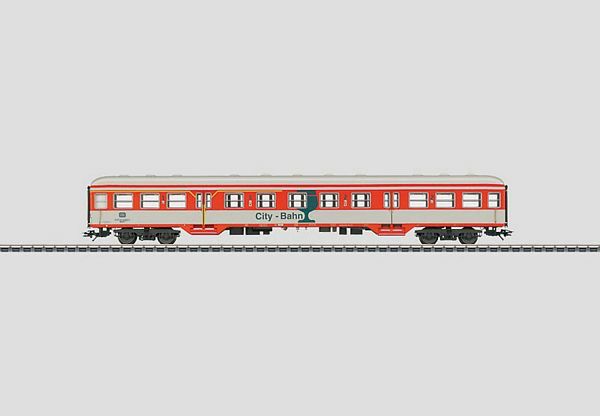 The class 218 City-Bahn locomotive and a City-Bahn car set to go with this car can be found in the Marklin H0 assortment under item nos. 39182 and 43808. This model can be found in a DC version in the Trix H0 assortment under item no. 23435.